How does one even review this? The 2012 The Three Stooges, while unbelievably cash-hungry and unnecessary in the very definition of the word, is not entirely horrible (I know, right?!). Directors and writers Bobby and Peter Farrelly have injected their “signature” bodily comedy into the film on a handful of occasions, but it’s not overbearing. One of the biggest gripes I have with this movie is that, even though normal or slightly short by movie standards, it is an exhausting 92 minutes. The brilliance of a good Three Stooges short is that it isn’t too long – maybe 10 or 20 minutes (the one genuine Three Stooges feature is nearly a half hour shorter than this). This is far too long for its own good – it might have some sense as an hour long TV special, but the feature length mandates that three minute chunks be filled up with things like our protagonists sneaking into a maternity ward and using infants and their urine like Super Soakers. The movie attempts to alleviate the run time by breaking the film into three parts. (If you choose just one, I’d recommend the first). Episode 1 traces the origins of the three. They were raised in an orphanage, where their legendary activities begin. By the time they’re ten years old, the nuns at the orphanage are straight up terrified of them, and will use any excuse possible to get rid of the young Larry, Curly, and Moe, none more eager than Sister Mary-Mengele (LARRY DAVID). 25 years later, any attempt at removing them from the orphanage has failed miserably, and the now adult Moe (CHRIS DIAMANTOPOULOS), Larry (SEAN HAYES), and Curly (WILL SASSO) work – or are assigned to work – performing maintenance and helping out around the building. However, their activities have caught up to them; the orphanage owes $830,000 in damages, and no insurance company will cover it. At the end of the month, the place will be forced to close, the nuns spread across the diocese, and the children sent to foster homes. Not willing to see this happen, the three set off to try and earn the money, which comes in the form of a woman (SOFIA VERGARA) instructing them to kill her “husband” (CRAIG BIERKO), which turns out to be a much larger plot involving Teddy (KIRBY HEYBORNE), who was a member of the orphanage as a child. Jersey Shore was a terrible show. It proves the Farrellys couldn’t figure out anything better. It will make the movie seem extremely dated (the move to include Jersey Shore, ironically, was to avoid making an older draft of the script seem dated when including an older reality show in its place (I think I heard it was Queer Eye)). 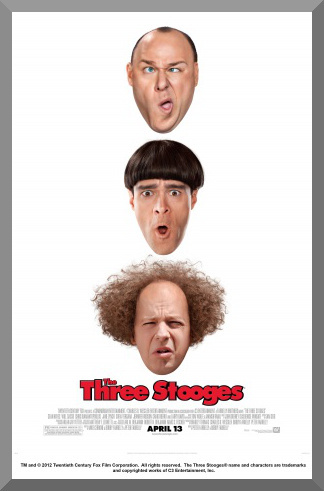 Is it that there was the worry that younger audiences wouldn’t accept a Three Stooges movie? By making it, the insinuation was made that the style was timeless, so what’s the point? While they were never going to be great, Diamantopoulos, Hayes, and Sasso do a surprisingly good job in the roles of the Three Stooges. There’s good comic timing and they play well off each other, or about as well as you’d expect for this kind of thing. There clearly was an intent to respect and pay proper tribute to the source, even though that factor is muddled in the end. 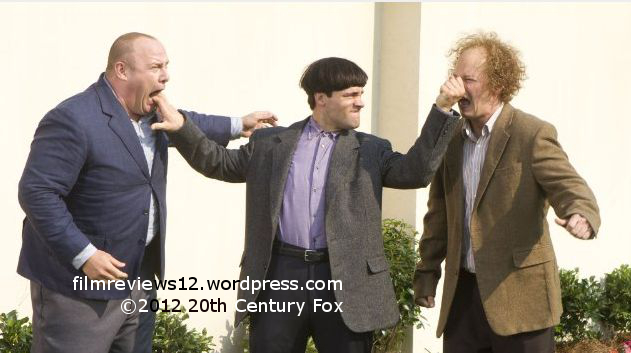 The Three Stooges is a well meant movie obscured in mediocrity, blatant and shameless attempts to find a younger audience, and a running time that only proves tiring.